Can we restore meadows by mimicking beavers? Beavers are the forgotten architects of California’s meadows. For thousands of years, beavers shaped the landscape by building dams that plugged up creeks and streams, creating ponds and wetlands that support a wide array of species, from amphibians to migratory songbirds to steelhead. But many people view beavers as a nuisance. Throughout the West, beavers have been trapped and killed to the point they no longer occur in many places they once thrived. Without the obstructions beavers once created in these stream systems, water moves more rapidly through the meadow, and that can result in a loss of many important functions. Beaverless meadows are drier, support less plant and animal diversity, sequester less carbon in soils and vegetation, and recharge less water to groundwater aquifers. Conservancy scientists are experimenting with ways to harness the restorative power of nature and turn this trend around. They are testing whether mimicking beavers can be a cost-effective means of bringing these meadows back to life – and even attract beavers back to doing their old jobs. A few miles south of Lassen National Park, Gurnsey Creek runs through a meadow that dried out long ago. Cattle grazing had eliminated the willows beavers need. The disappearance of willows and beavers was accompanied by the loss of rare and threatened species like the Cascades frog and the willow flycatcher. Yet, all of these species still occur further downstream. 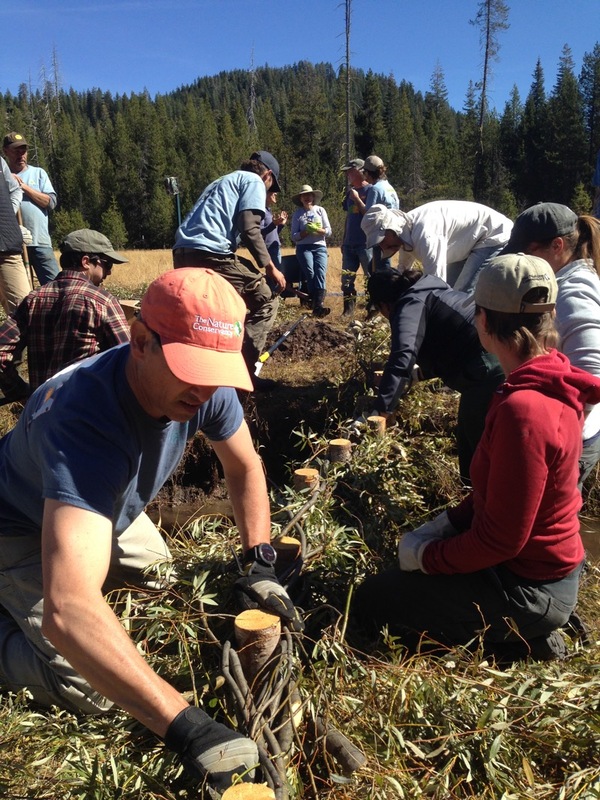 Inspired by successful stream-and-meadow restoration experiments in Oregon, the beaver dam analogue method they pioneered is simple. First, we fenced the cows from the stream corridor. Then we pounded numerous posts on either side of the stream, and wove willow reeds and branches between them. 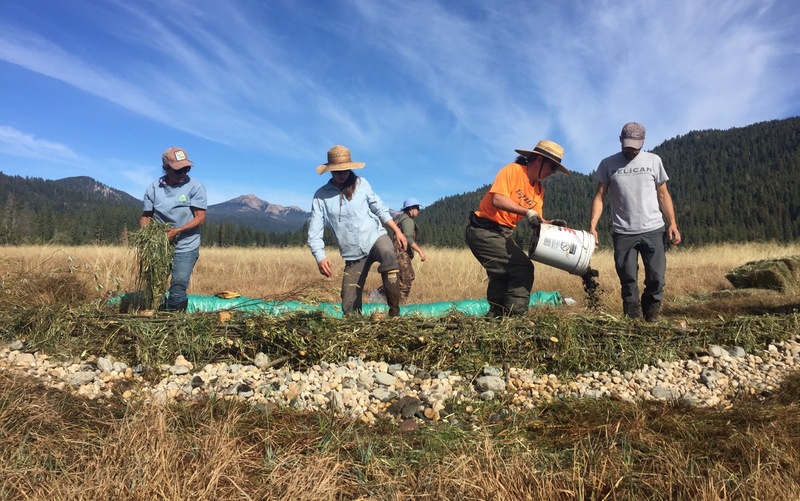 Altogether, we installed six mini dams, packing their upstream sides with sediment and hay, and the downstream side with small rocks to prevent erosion. In partnership with the University of California, Davis, the U.S. Forest Service-Pacific Southwest Research Station, and Point Blue Conservation Science, we’re monitoring these sites to see if the wetter, dammed up landscape will attract frogs and willow flycatchers and even beavers themselves to return. We’re also testing to see if the dams will increase underground water storage and carbon sequestration. Mimicking nature in the form of simple, temporary dams is significantly cheaper, easier and less intrusive than alternative methods that require heavy earth-moving equipment. If it works, it could be easily replicated, and bring nature’s original meadow architects back home to restore meadows across the West.